Philadelphia, PA – A dirty and disheveled Tony Siragusa is still wandering around the end zone of Lincoln Financial Field four days after the conclusion of Sunday’s Eagles vs. Saints game. The former defensive tackle. now announcer, has been shambling around both end zones of the Linc for the better part of this week, speaking in hushed tones to himself and shying away the from worried security guards who have tried to wrangle him several times. The announcer has been periodically speaking into an impromptu microphone made out of a discarded soda cup and gesticulating wildly to invisible television cameras. “Every so often I’ll hear him mutter ‘touchdown Eagles’ to himself, perhaps calling a game that only he can see. Anytime someone tries to get him to leave he mumbles to himself and skitters away to the opposite field. He’s a big guy, tough to get him to do anything he doesn’t want to do. We’re not taking any risks out there, we’ll let the league handle this one. Jesus.” Eagles security representative Lou Ponder said. 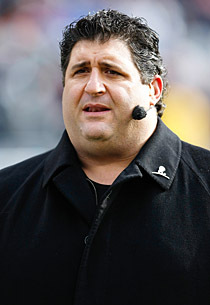 Siragusa has reportedly been defecating in the corner of one of the fields and has subsisted on the leftover pizza crusts, soft pretzels, and hard rolls that have yet to be cleaned from the stadium. When asked for comment, an NFL representative said a special “Goose Squad” will be dispatched to Philadelphia if he hasn’t wandered away from the stadium soon. At press time, several grim faced, heavily armed men wearing body armor said a brief prayer together before piling into a “Goose Squad” van and drove towards Lincoln Financial Field.